Coral reefs are diverse underwater ecosystems built by colonies of corals. 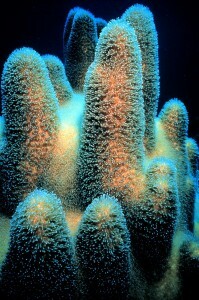 Corals are important reef builders that inhabit tropical oceans and secrete calcium carbonate to form a hard skeleton. Most coral reefs are built from stony corals and they grow best in warm, shallow, clear, sunny and agitated waters that contain few nutrients. Corals are tiny animals (polyps) that live in colonies. Symbiotic algae (zooxanthellae) live inside the polyps. The algae need light to execute photosynthesis, just like plants on land. The animal-part and plant-part of the corals live in symbiosis, which means they benefit from the presence of the other. Some corals can catch small fish and plankton, using stinging cells on their tentacles, like those in sea anemone and jellyfish. Most corals obtain the majority of their energy and nutrients from photosynthetic algae that live within the coral’s tissue. This energy is used for growth, reproduction, and feeding. Often called “rainforests of the sea”, coral reefs form some of the most diverse ecosystems on Earth. They occupy less than 0.2% of the world’s ocean surface, about half the area of France, yet they provide a home for 25% of all marine species.